Brown feather wings inspired my Native American art. Wings measure 12" high and have a wing span of 36". Wings are one size fits all. 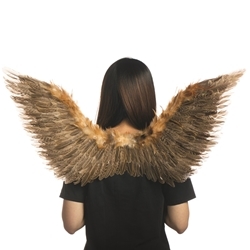 These wings will work well for a number of different characters including birds, owls, fairies, and other mystical creatures. They would work well for actors playing the birds in The Lion King.